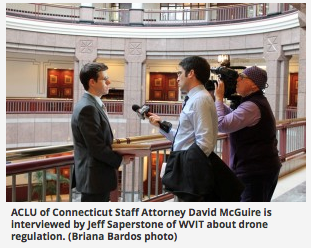 I have been interning at the American Civil Liberties Union of Connecticut since July 2013. I was originally only planning to intern there for the fall semester, but I was so immersed in the organization and the work I was doing I couldn’t tear myself away! To give you some background information, the ACLU of CT is a nonpartisan, nonprofit organization whose mission is to defend, promote, and preserve individual rights and liberties under the United States and Connecticut constitutions in state and federal court, the General Assembly, and the 169 towns and cities of Connecticut. The ACLU of CT is an affiliate of the national American Civil Liberties Union. 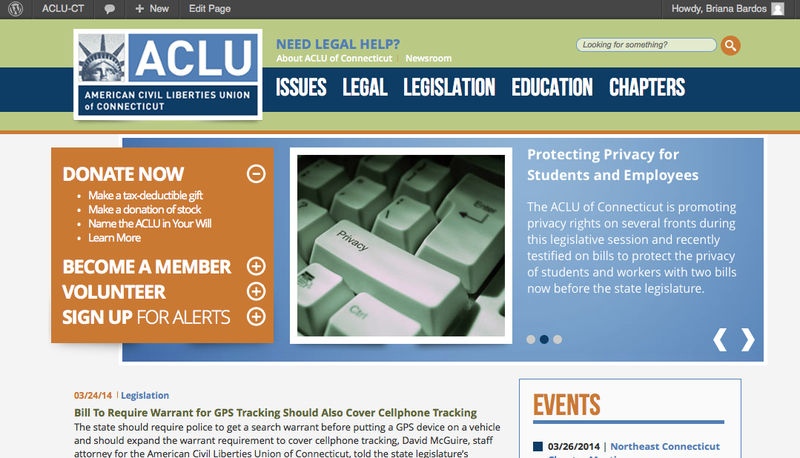 As an intern of the ACLU of CT, I was originally working on the new website that was soon to launch. I have experience with coding and data transfer from various online platforms, so it was something I was pretty comfortable with. The current website at the time was very old and outdated, so I was primarily responsible for transferring certain sections of data from the old website and manually entering into the new site. I also was responsible for updating the In the Media section and Weekly Email section of BOTH websites (while we were working on the new website, we had to continue updating the old site so we had to do double work for a while). We launched the website in the middle of the semester, and it is beautiful (my boss, Jeanne LeBlanc, worked extremely hard on it and the product is just great). Once we updated the website, I started working on bigger projects, though I still do routine updates for specific sections. The biggest project I’ve done stretched from the end of last semester into the beginning of this semester, which was on cell phone tracking data usage by police departments. In a nutshell, I had about 1,000 pages of FOI requested documents by all the police departments who are required to report on this data in CT, and it was my job to go page by page to create and excel worksheet compiling all the data. I then crunched all the numbers, and once that was completed created an info sheet to send on to a reporter who was doing a story on cell phone tracking in CT (the story is available here: http://www.nbcconnecticut.com/video/#!/on-air/as-seen-on/Are-Police-Collecting-Your-Digital-Records-/246997421). Now that we are in legislative session, most of what I’ve been working on relates to proposed legislation. I’ve done research for the ACLU of CT’s testimony on various bills, for example the proposed FOI law change bill, school drug zones bill, and anti-discrimination bills. I have also gone to the legislative building to take pictures for the website (such as the one below). My internship has really reinforced what I’ve learned in my human rights coursework at UConn and has expanded my understanding on how human rights organizations function. We constantly talk about civil rights (i.e. freedom of speech, religion, press, information, etc. ), but working at the ACLU of CT has made me realize even further what it means to have these rights and how to fully exercise them. It has also exposed me to the frequency that these rights are violated and the importance of a nonpartisan, nonprofit like the ACLU of CT to helping those whose rights have been violated, as well as trying to prevent the violations from occurring again in the future. My internship at the American Civil Liberties Union of Connecticut is an experience I will never forget. I have a better understanding of what it means to work in the human rights field; this experience has reinforced my decision to major in this field and my plan to eventually get a job relating to human rights in some capacity. This internship has allowed me to grow as a human rights scholar in ways unimaginable, and the people I have been able to meet and work with have changed my life for the better. All in all, I couldn’t have expected a better internship experience. Briana Bardos is a junior in the Honors Program dual majoring in political science and human rights. She is looking forward to continuing researching and working in the human rights field at UConn, culminating with her honors thesis on the empowerment of Guatemalan women through social entrepreneurship.